I run a paint-your-ceramics studio and thought this would be fun to try on ceramic so gave it a go. 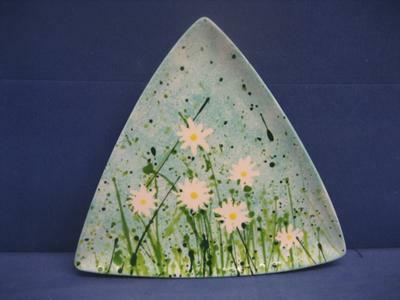 Bisque (unglazed ceramic) is incredibly porous so I sponged a couple of colours on having used a masking fluid to shape my daisies. The rest I followed pretty much as suggested. Thankfully underglazes are water-based so clearing up was really easy, if you use acrylics you'll need to cover up really well I was amazed how far my paint splatters travelled not to mention the state of my hair! Many thanks - I'd love to share this idea with my studio. Join in and write your own page! It's easy to do. How? Simply click here to return to Your Daisy Painting.